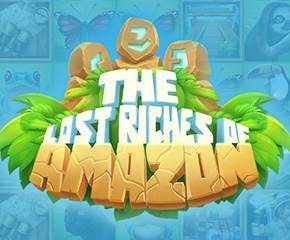 The Lost Riches Of Amazon is an online casino slot with an adventure theme. It features two young explorers in search of ancient Aztec artefacts in the Amazon forest. Players can find their own treasure from the bonus features in this game. The Lost Riches Of Amazon slots with 4 rows, 5 reels and 2048 way to win. Players can hope to land combo wins by matching symbols from either right to left or left to right of the reels. The reels cover most of the background, but you can still see ancient Aztec ruins set in a jungle scene. You have insect and animals that can be found in the Amazon which makes up part of the symbols in this slot. This insect and animals include a butterfly, a puffin, a toad, a sloth and a jaguar. The young male and female adventurers are also symbols on the reels as well as a backpack, a map and some Aztec temple steps. 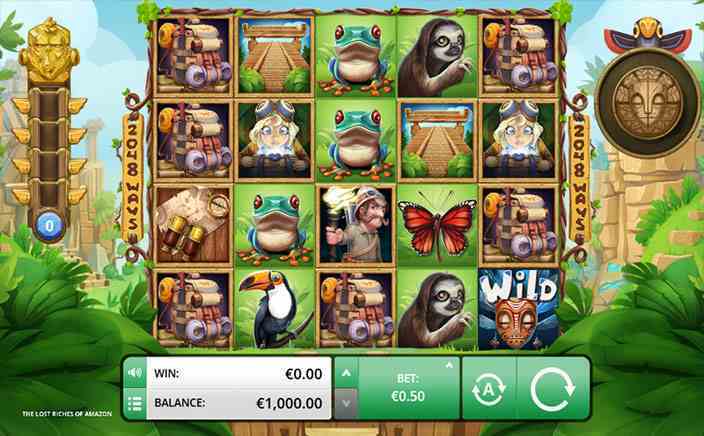 The Lost Riches Of Amazon slots has two Scatters and a Wild symbol. The two Scatters include a Lucky Coin and a Golden Monkey Head icon. The Wild symbol is represented by an Aztec Mask icon. You can earn free respins whenever a Luck Coin Scatter symbol shows up on the reels. As you play the respins round you can land more Lucky Coins and trigger additional respins. A Golden Monkey Head bonus feature is also capable of activating this respins round. There is also a Wild Bonus round that is activated when you pick up at least 12 Wild icons. You will see a meter to the right of the playing screen which fills up as you land Wilds. Once you have 12 wilds on the meter, you will have three wilds appear at random on the reels with the exception of reel 3. The wilds help you in landing winning combinations in this round. The graphics and animation in this slot are cartoonish but of very good quality. The bonus features will encourage players to play for a long time and the RTP is a decent 96.06%.